The recording of the sermon starts off with Ergun Caner making more claims about watching TV in Turkey (no Dukes of Hazzard mentioned as in other lectures). When the congregation laughs at his claim that all of America was like Mayberry he says, "it's true" and when gets to the part about watching Georgia Wrestling he says, "this is a little embarrassing, but it's true" and goes on to claim that he would get this wrestling show every two weeks in Istanbul for two hours. He even specifies the channel as "BEER-oo-key." Like a number of other countries, Turkey's television channels were originally numbered channels. TRT 1 is the first channel, TRT 2 is the second channel, and so forth. More recently, with a proliferation of television, there have been additional channels. However, it appears that until 1986, it was just TRT 1 (TRT 2 began transmission in 1986)(TRT 3 began transmission in 1989)(TRT 4 began transmission in 1990)(and so forth). My familiarity with Turkish is obviously limited, but the Turkish word for "one" is bir (apparently pronounced "beer") and the Turkish word for "first" is birinci (apparently pronounced "beer-EEN-jee"). There is apparently a separate word, ilk, for the one-and-only, first-of-a-kind. So, it occurs to me that it is questionable whether there was a channel "BEER-oo-key" in Turkey before 1982 and whether or not Dr. Caner is simply mispronouncing birinci to try to provide some gravitas to the presentation of what otherwise appears to be a false story of growing up in Turkey. This sermon is also one where Caner makes his infamous joke about women being behind the pulpit. He says something to the effect of that when people ask him about whether women should be behind the pulpit, he responds "how else are they going to vacuum back there." The joke get the hoots and hollers of the crowd, although Caner goes on in the next line to point out that the feminists who advocate for women in the pulpit will not only learn his view on the subject, but will also refuse to talk to him about this for a while, which he views as a good thing. Some people have suggested that this is a "sexist" joke, but I don't buy into that - he's poking fun at feminism and feminists, not at women as women. I'm not saying it is a wise joke to tell from the pulpit, but it's hardly a matter of major significance, compared to the other things we've seen. In an interesting twist, in this same sermon, Caner suggests that the pastor who lead him to Christ, Clarence Miller, was a KJVO pastor. Caner even claims that Miller taught them to sing: "The B-I-B-L-E, and the version is the K-J-V, I'm going to heaven with the 1611, the B-I-B-L-E!" and then Caner followed that song up with another like it: "I dreamed I went to heaven, and I dreamed I went to hell, because you wouldn't witness to me, I walked along the lake of fire and read the N-I-V."
Later in the sermon, Caner states: "In my family, my father had many wives. I had many half-brothers and sisters." (around 21:29 into the sermon) The only children that Acar Caner mentions in his will, however, are Caner's two half sisters who were both the daughters of Acar Caner's second and surviving wife (link to copy of will). At least, we cannot find any record of Acar Caner having any other wives except Ergun's mom and the woman who married Ergun's father after Ergun's father and mother got divorced. One interesting thing is Caner's comment (around 43 minutes in) that "my grandma didn't have 81 types of medicine, she had Bactine, Merthiolate, monkey blood, y'all know what I'm talkin' about?" The comments suggests Caner was raised by his grandmother, although the rest of his references were to "mama" so perhaps it was just a misstatement by Caner. UPDATE: In a lecture called The Gospel According to Oprah (mp3) dated 2/8/2010 according to SermonAudio.com, Caner makes similar comments around 30 minutes in suggesting that he was raised by (and even received corporeal discipline from) his grandmother in addition to his mother. Perhaps it is just a coincidence but he mentions them as being the ones who disciplined him. N.B. It seems that some of materials I have been linking to have been disappearing from the sites where they are hosted. The same thing may happen to this sermon, but SermonAudio.com permits you to download this sermon at the link I've provided above. UPDATE: to replace Mathylaid (sp?) with Merthiolate, thanks to John Bugay. A high school buddy invited Caner to a small church revival in Columbus, Ohio. His friend was not intimidated by Caner's Muslim clothes or flawed English. And no one in the congregation ridiculed him with epithets of "towel head" or "camel jockey," as he had heard at school. Born in Stockholm to a Swedish mother and Turkish father, Caner lived in Turkey, Lebanon and Egypt before coming to America as a missionary. His father was a muezzin, the official at a mosque who gives the call to prayer. Instead of welcoming the news, Acar Caner told his son he no longer wanted to see him. When younger brothers Emir and Erdem (who now goes by Mark) went for visitation with their father, there was no talk of Ergun; their elder brother's face had been cut from family photographs. Despite that, the two younger brothers soon followed Ergun's path, with the same results. The Caners are convinced otherwise. As boys growing up in Ohio, the two converted to Christianity after being invited to a Baptist church in their neighborhood when they were teenagers. Their conversion cost them the love of their father, who disowned them for more than a decade. Emir Caner said the break came at dinner one day when he was 12 years old. "I told him I could not pray to Allah anymore. I found Jesus Christ as my savior," Caner recalled. "He said, 'You either choose between me or your religion.'" But at 16, Ergun attended Stelzer Road Baptist Church in Columbus and says he found salvation through Jesus Christ. When he told his father, Acar made him choose. Ergun lost his earthly father, he says, by choosing his heavenly Father. "My father thought what he was doing was an act of mercy by disowning me," he says, pointing out that his father could have sent him to Turkey to immerse him in Islam. In other places in the world, he says, people who leave the Islamic faith are to be put to death. "This was hard for me," he says. "My father was my hero. My father was everything to me." Ergun's two brothers would follow suit within 18 months. And just as he had done with his oldest son, Acar Caner broke ties with his young sons. Emir and another brother would go live full-time with their mother, who later converted to Christianity. The sons wouldn't see the father again until days before his death. In 1999, they received a surprise call from a stepsister whom they had never met when their father was dying from cancer. They flew to Ohio not knowing whether he would want to see them, and they thanked God when he did. "It was, of course, awkward," Ergun says, noting that men from the mosque were also present. "We tried to share the gospel with him. He tried to share Islam with us, trying to get us back." Some people have suggested that the earlier testimonies are more accurate than the later ones. It may be possible that Caner's family lived very briefly in "Turkey, Lebanon and Egypt" before coming to the U.S. However, Caner himself was apparently two or three years old when the Caners arrived in America. I do wonder whether the "15 years old" information is correct. That report is inconsistent with the November 4, 1982, date that is sometimes given, but it is consistent with the idea that Emir Caner came to faith on November 4, 1982, and that Ergun Caner was saved about a year earlier. The "15 years old" information would be consistent with Emir's "12 years old" information and a gap of one year between their conversions. However, it is not consistent with the "16 years old" and the "18 months" gap suggested by the final story quoted above. In short, even if we go with only the Caner testimonies that are presented in the press in 2002, we already see a set of seemingly impossible to reconcile differences emerging. UPDATE: Fredericka in the comment box has identified an article apparently from Connection Magazine, September 2002 (link to article). That article says Ergun was 17 (which is even more inconsistent with the accounts above), "But he was raised in a strict Muslim home in Ohio and was a devout worshiper of Allah until age 17, when he was led to Christ through the witness of one of his high school friends." The article also indicates that Ergun lead Emir to Christ: "Caner in turn led to Christ his own brother, Emir, who today is a professor of church history at Southeastern Baptist Theological Seminary in Wake Forest, North Carolina." "For the first 17 years of my life, I assumed that I was to be at war" with Christians, Jews, and other non-Muslims, Caner recalls. He adds that according to a conservative U.S. State Department estimate, there are currently 300,000 Muslims worldwide with that identical driving ideal - the doctrine of jihad. "It wasn't through the eloquence of a preacher, or the beauty of a building that I came to Christ," Caner explains. "It was through the simple witness of a high school boy who did not care that I wore my [Muslim] robes, and looked different, and spoke different, and had poor English. He did not care that I hung out with other Muslims because everyone else was an open enemy according to my faith. All he knew was that Jesus Christ had died for him and had died for me, and he was saved and he wanted me to get saved, too." That high school boy invited Caner to a four-day revival campaign at a local Baptist church in Columbus, Ohio, where Caner experienced the love of God for the first time. "That church loved me to the cross of Jesus Christ," Caner recalls. "They were nice to me in spite of my open hatred toward them as Christians." For four days, Caner heard the good news that Jesus Christ was more than just a prophet of Allah as he had always been taught. He was God who came in the flesh to die for the sins of all people. By the fourth night, the 17-year-old devout Muslim was ready to become a new creature in Christ. Caner recalls that the pastor explained God's mercy and grace in the simplest possible terms. The July 2, 2002, Associated Press article about the Caner brothers provides a very touching portion that shows the love of Acar for his sons, despite their departure from Islam (Republication of Article here). Sitting in his office on the picturesque Southeastern campus at Wake Forest, Emir Caner flips open the cover of a thick blue book. It is the Quran his father, Acar, presented him from his deathbed in 1999. "To my son Emir," reads the inscription on the first page. "This is yours. Please take the time and read each word for you and for me. Your father." Let me anticipate one objection. Someone may say that this shows that Acar Caner did not completely disown his sons, because he still refers to Emir as "my son" and calls himself "Your father." To me, that's a trivial objection. All it shows to me is that he still loved his sons. But there are two other things that cause me to raise my eyebrows. Acar Caner has been presented as an exceptionally devout Muslim. Perhaps one of my Muslim readers will be able to tell me whether (1) giving a Koran to a non-Muslim is permitted and (2) writing in a Koran is permitted. I don't claim to be a Islamic scholar, but both of those things strike me as inconsistent with the strictest and most devout forms of Islam. The rituals associated both with handling and reciting the Koran involve a large amount of outward purity. Giving the book to a non-Muslim (particularly an apostate Muslim) or writing in the book, just intuitively seem to be at odds with the kind of precautions Muslims are supposed to take with respect to the Koran (see some examples here). Perhaps one or more of my Muslim readers will be able to clarify this for me. First, here are some post-9/11 testimonies. According to a transcript, in one appearance on the 700 Club, Caner appeared to indicate that he was led to Christ, then his brothers, then his mother, and finally his grandmother. What's wonderful is that day my father disowned me, but both of my brothers accepted Christ. My younger brother teaches at a seminary, I teach at a Christian College, my middle brother is a strong Christian and a member of a church, our mother accepted the Lord and is married to a church planter, and my grandmother accepted the Lord right before she died. The man who led him to Christ is still alive. Clarence Miller. He has attended all his inaugurations and graduations. If he or Emir were two white boys lying about being devout Muslims, do you really think he would abide that? There are some inaccuracies in the poster for the conference. For example, Dr. Caner was at that time apparently studying for a Th.D. not Ph.D, and his father was not a Muslim clergyman, as far as we can tell. Caption: "Dr. Caner Reading in Mosque"
Caption: "Dr. Caner in the Mosque with his father." Caption: "Dr. Caner in the Mosque youth group holding a rifle." 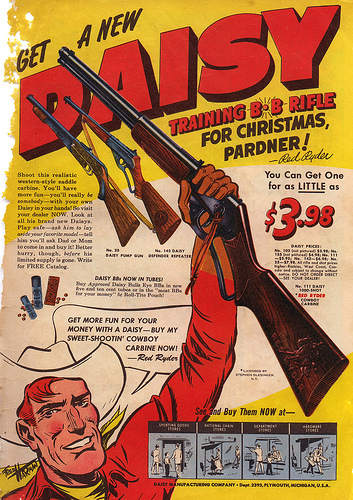 Returning again to the third picture, note that there is no obvious safe backdrop for a real rifle to be used. However, if you look very closely, you will see above the elbow of the boy's left arm an unusual shadow that could be the shadow of the horizontal portion of a small shelf or stand, or it could be a shadow of a paper target held in the boy's hand - or any number of things. It's really not clear. Such a target or stand would be consistent with playing some sort of shooting/target practice game, although the target and the support for the target is more or less completely obscured by the boy at left. Perhaps someone with sharper eyes than mine can make it out. Essentially, some folks have raised the spectre of Dr. Caner claiming a false PhD and/or DMin degree. Considering that Dr. Caner did earn a ThD, I'm not sure how serious this charge is, but I've tried to identify the relevant evidence below. Caner has three Masters Degrees and two Doctorates, the Doctor of Theology coming from the University of South Africa. Caner holds a doctor of theology degree from the University of South Africa in Johannesburg; master of divinity and master of theology degrees from Southeastern Baptist Theological Seminary in Wake Forest, N.C.; and a bachelor of arts from Cumberland College in Williamsburg, Ky. In the years that followed, Dr. Caner surrendered to the Gospel ministry and continued his education. He received his Bachelor of Arts in biblical studies and languages in 1989 from Cumberland College in Williamsburg, Ky. In 1992, he received his Master of Arts in history from The Criswell College in Dallas, Texas. In 1994, he received his Masters of Divinity from Southeastern Baptist Theological Seminary in Wake Forest, N.C., and in 1995, he completed his Masters of Theology at Southeastern. In 2000, Dr. Caner received his Doctor of Theology from the University of South Africa in residence in Johannesburg. However, note that the list does not include any PhDs or any explanation of claims for a PhD. N.B. Mirele has studied this issue as well. I understand that at the University of South Africa they call it a "thesis" rather than a "dissertation." Nevertheless, in investigating Dr. Caner's educational claims, I was able to locate evidence of publication of the thesis, though not under the precise name Dr. Caner had provided: Bellum sacrum: the development of the Holy War of the first crusade in light of Augustine's Just War criteria. (source) It is 416 pages (208 double-sided leaves) and was published in 2003, under the name Ergun Mehmet Caner by the University of South Africa. I did verify that it is available in the library at the Main Campus (apparently) in Praetoria and that it was given with respect to a doctorate in theology (source). If any of my South African readers have the occasion to stop by that library and confirm that the Internet data is correct, I'd be most appreciative. Note the 2003 date, which makes me think this is the published version of the thesis that I had previously mentioned, as opposed to whatever version he provided in 2001 when he supposedly matriculated. On January 22, 2010, the Pastor's Perspective aired the show that can be found at the following link (source)(found among the other Pastor's Perspective shows here). This is the source of Dr. Caner's infamous comparison of the Jerry Springer Show with formal debates (link to Dr. White's response to that comparison). The vast majority of the e-mails, numbering over six hundred, were from grateful Americans, many soldiers, who felt that their voices were not being heard. Mothers and fathers of soldiers who felt grateful that an article would run, supporting our troops from someone like me, a Persian Turkish immigrant and former Muslim. Compare this discussion (link). I think, though, that Caner's point is just that he didn't hide from the Muslim persecutors. In this regard, his courage is to be praised. I would classify this as a simple misstatement, if "Mehmet" is not his real name. As far as we can tell, Dr. Caner lost only his non-custodial father (see appeals court decision of 2/6/1979 mentioning the custody issue). While this is a significant and tragic loss, it appears that Dr. Caner is exaggerating. Question to Ergun: "Now how was it that your brothers came to faith? Was it through your witness to them or ..."
Ergun's brothers, however, listened. Erdem accepted Christ in the basement of their home. Ergun then invited Emir to a revival service the following year. There, for the first time in his life, Emir heard that God loved him and desired to have a personal relationship with him. Though he had been to church before, this was the first time he could recall hearing a preacher speak openly and honestly about the exclusivity of the gospel. Only through the blood of Jesus, spilt on the cross, can someone be saved. Yet the preacher also spoke compassionately about God's desire to save everyone. Although there was only one way, the path was open for all who would believe. On November 4, 1982, Emir was born again. In 1982, Ergun surrendered to the gospel ministry. It was the last time he saw our father for seventeen years. Acar disowned his sons, although it could have been worse: according to hadith 9.57, all three of brothers should have been killed. You guys ever hear a first sermon? I went up there with about that many notes, about 4 hours of preparation and lasted seven minutes. You know. I was like, "Jesus - uh - the Devil - uh - lets sing 842 verses of 'Just as I am.'" But you see, at the invitation, both of my younger brothers stepped out. Both my younger brothers got saved. H.T. Thanks to BruinEric for bringing this mp3 to my attention. The big picture, that Ergun Caner is a real ex-Muslim is true, but Dr. Caner has muddied that issue with what appear to be a myriad of details that are inconsistent and difficult or impossible to reconcile with one another. One is left wondering where the fiction ends and the fact begins. Here's an example. Entering high school, Ergun was a typical young man, except that he was a devout Muslim. Even through the divorce, our parents had maintained our rearing in the Mosque. Each weekend, we would travel to Broad Street in Columbus, Ohio, where our father had helped found the Islamic Foundation. The mosque in Toledo was too far a drive, so the Foundation Center was established. Father did the call to prayer on occasion. Since 1970, the Islamic Foundation of Central Ohio (IFCO) has been serving the educational, social and religious needs of the Muslim families of Central Ohio in the United States of America. The Islamic Center of Greater Toledo is the 3rd Mosque ever bult in America. It has been around since the early 50s and since 1981 has been located off of I-75 in its current iteration. ... It was not until 1954 that Toledo's first Islamic Center was built on East Bancroft Street, near downtown, fulfilling the needs of the Muslim Community. With the influx of many more Muslims to the Greater Toledo area in the late sixties and early seventies, the Bancroft Street Center could not meet the religious and social needs of its members. After much deliberation and soul searching, it was decided to build a bigger and better facility in order to meet the ever increasing needs of our members. The present new Center in Perrysburg Township had been in the planning for over a decade. ... In 1978, forty-eight acres of land was purchased in Perrysburg Township. The foundation of the Center was laid in October 1980, while the actual construction did not begin until September 1982. The building was officially opened on October 22, 1983. Two wings were added in 1991 to accommodate increased enrollment in the weekend school and to expand the social hall facility. We came to America in '78 when Ayatollah Khomeini said, "We will not stop until America is an Islamic nation." One is simply left wondering what to think. Not all of those things can be true, as far as I can see. And it is hard for Caner to mistakenly think he came in 1978 instead of 1970 or earlier. It is hard for Caner to accidentally think that Toledo was too far to drive, or vice versa to think he drove there every week. Ergun Caner's Middle Name is What? Ergun Caner's father's middle name is "Mehmet." Is that Ergun Caner's middle name? It's not clear if it is or ever was his real middle name. I've tried to track down references to Dr. Ergun Caner before 11 September 2001. In his high school yearbooks (1981-1984) he is listed simply as Ergun Caner, no middle name provided (UPDATE 5/26/2010: There is one exception. His middle name "Michael" is provided in his senior yearbook). In a publication of the Southeastern BTS (circa 1993-95) (shown at left), Caner's middle name is listed as "Michael." The following are the other datable instances of his name that I've been able to track down. UPDATE 2/11/2014: (June 8, 1989, The Mt. Vernon Signal Thursday) Mentions that "Three students were recognized as Presidential Scholars. They were Ergun Michael "Butch" Caner of Gahanna, Ohio; ..." referring to an award received during the 1989 commencement exercises at Cumberland College. (source) (he was still referred to by the "Butch" nickname when referenced in an Cumberlands alumni magazine in Spring 2007 - source). UPDATED on 2/11/2014: (October 1999) "Glover recently hosted a luncheon that was keynoted by Dr. E. Michael Caner, Pastor of Central Baptist Church in Aurora, Colorado. Dr. Caner spoke about his experience as the lead minister on the scene of the Columbine High School shooting in April." In addition to the above, even to this day in court records (available via this link) Dr. Caner's name is always listed as Ergun Michael Caner (on various minor traffic tickets and a concealed weapons permit). Did Dr. Caner change his name at some point? If so, there should be a legal record of the name change somewhere. Furthermore, since giving a false name on one's motor vehicle registration is a misdemeanor crime in Virginia (same for a false name on a driver's license application), it seems reasonable to assume that "Ergun Michael Caner" is Dr. Caner's real name today. The question then is this: why does Dr. Caner use the name "Mehmet" in his post-9/11 writings and self-promotion? Is it his birth name? Is it simply an alias? N.B. There is always the possibility that the correct answer is that Caner's name is "Ergun Michael Mehmet Giovanni Caner" as he claimed here (link) (also claimed here). P.S. The Caner Brothers' book, "The Sacred Trust," was apparently published in 2003. 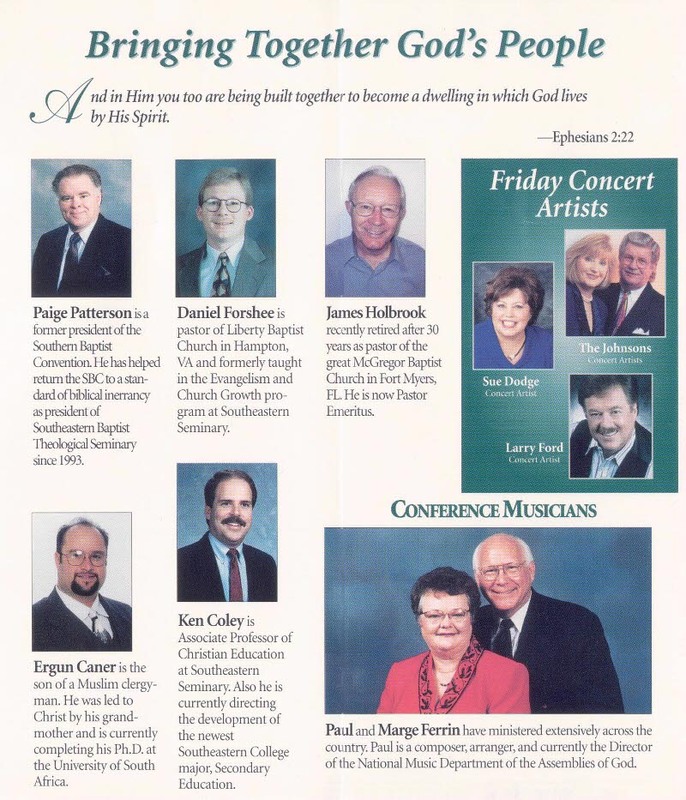 In Lifeway's June 2003 brochure, it was advertised under the name Ergun Michael Caner (link to brochure). Dr. Ergun Caner is fond of ascribing various roles of importance within the mosque to his father. I have found nothing to corroborate his testimony in that regard. However, I have found some evidence that Ergun's father, Acar Caner, was prominent within the Turkish community. For example, I found that Acar Caner was President of the Turkish American Association of Central Ohio from 1983-84 and 1993-94 (source - including grainy photo). One is reminded as well of Jamal Jivanjee's carefully worded comment (discussed at greater length and with more context here) that "Mr. Acar Caner, was a very prominent leader within the Islamic community that we associated with and was very involved with this mosque." Technically, this prominence took place after Dr. Caner's conversion (the latest date for Dr. Caner's conversion is 1982). However, one would not expect Mr. Caner to rise to president in the first year or two of being involved in the group, so this evidence helps to confirm (and perhaps to clarify) some of Jamal's testimony regarding Acar Caner. One objection that is occasionally addressed to the Reformed doctrine of the perspicuity of Scripture, and also sometimes to the doctrine of the sufficiency, formal and material, of Scripture, is a request that we provide an exhaustive list of the doctrines that are necessary to salvation. After all, we claim that all the things that are necessary to be known for salvation are clearly taught in Scripture. Some folks think this is an incredible claim unless we can provide a list of the necessary things. There are several rebuttals to this objection. In other words, while one may need to know the essential doctrines, there is no requirement that one be able to distinguish the essential doctrines from the unessential doctrines. So, even if the Bible does somehow tell us which doctrines are essential, that list is not something that falls within the realm of the doctrine of perspicuity. Furthermore, if we reach the conclusion that the Scriptures do not provide such a list, the doctrine of the sufficiency of Scripture would simply confirm that such a list is not necessary to the rule of faith. In other words, we reason from the fact that the Scriptures are able to make the simple wise and specifically in order to make a person wise unto salvation, that they consequently teach with sufficient clarity all that must be known for salvation. The field of medicine provides an analogy. Suppose you have a drug that you realize cures some particular ailment, such as malaria. There is no reason you need to know which ingredients in the medicine cure you, you just need to eat the medicine. By analogy, you do not need to know which doctrines of Scripture are essential. You just need to believe what the Scripture teaches. If you do so, that should lead you to repent of your sins and trust in Christ alone for salvation. Christians are required to believe all of the Bible. The canonical Scriptures are our rule of faith, and only the canonical Scriptures are our rule of faith. Adherence to the rule of faith is not the way that people are saved, but it is a Christian duty. It is through believing the gospel that the Bible proclaims that sinners are justified. Our inability to identify those points that are essential should simply prod us to study Scripture more intensively and seek by prayer and study to understand it more fully. Dr. Norman Geisler's alleged comments on the Caner scandal may be found here (link). The following is a detailed response. Geisler's remarks have an odd rhetorical structure. In this structure there appear to be three motifs. The three motifs above share as their common thread an attempt to negate the idea that it has been shown that Caner did anything seriously wrong. However, there is little substantive content to Geisler's remarks, and the little content that exists is illuminating. Geisler states: “I am familiar with the slanderous charges that have been made against Dr. Ergun Caner generated by some Muslim groups and other extremists.” There are two interesting things about this comment, Geisler does not identify even one of the charges with any specificity and Geisler does not accurately identify any of the critics. Mr. Mohammad Khan is one source of some of the charges. He is a Muslim, but not a Muslim group. I'm confident that Geisler cannot name a Muslim group (let alone two) that have been generating charges. Geisler also mentions “other extremists.” This is odd for two reasons. First, it seems to assume that the referenced “Muslim groups” are themselves extremists. Second, it seems to suggest that the other vocal critics are extremists. But who could Geisler possibly have in mind? Geisler's notorious book, “Chosen But Free,” used the pathetic rhetorical ploy of referring to five-point Calvinists as “extreme Calvinists.” Could that be what Geisler intended? After all, some of the people bringing the accusations are Calvinists. In any event, the folks who have been making the accusations public include a wide range of people. Geisler appears to be unfamiliar with the broad range of folks bringing the charges. Geisler describes his investigation of the charges. Geisler states: “I have looked into the matter, talking with Ergun and other principal parties at Liberty ... .” We would hope that both Caner and other “principal parties” would be candid with Geisler. Geisler, however, seems to be unaware of the fact that those who have criticized Caner have also criticized the words attributed to Elmer Towns co-founder of Liberty University and dean of the School of Religion, who was recently quoted as saying “It’s not an ethical issue, it’s not a moral issue,” and “We give faculty a certain amount of theological leverage. The arguments of the bloggers would not stand up in court.” Likewise, Ergun Caner had stated: “The truth is, I would be surprised if no discrepancies were discovered, given the hundreds of messages I have given during all that time!” And further: “I have never intentionally misled anyone.” (see discussion here) If Geisler were familiar with the actual evidence presented, he would realize that these sort of blanket assertions don't address the evidence. Geisler seems to present a few straw man positions. Geisler states “Dr. Caner has done nothing heretical, immoral, or illegal” and “He ... has done nothing unorthodox or malicious.” While there have been some minor comments about illegal activity (speeding tickets and the like) and doctrine (Caner's apparently erroneous view of Incarnational Sonship) the real charges of immorality do not include things like saying that Caner has committed sexual immorality but are limited to untruthfulness. Since his alleged lies are about himself, it would not be obvious for them to be malicious. Geisler's comments employ ad hominem both positively and negatively. Negatively, the comments call Caner's critics “extremists.” Positively, the comments simply amount to Geisler stating his final judgment of the matter. Geisler does not tell us what charges he examined, what evidence he considered with respect to those charges, and why he reached his conclusions in view of the charges and evidence. Instead it simply appears to be an attempt to appeal to folks who have high regard for Geisler's opinions in general. Geisler's article ends up backfiring on him. His failure to demonstrate any serious investigation of the facts or consideration of the charges suggests that his opinion is based more on his personal esteem for Dr. Caner (Geisler states: “I stand with him against these vicious attacks. He has taken a strong stand on important issues that stir up controversy ... .”) than on any valid criteria. As such, Geisler's comments are just hand-waving, and may be readily set aside. Geisler hangs his comments on his own credibility, but he undermines his credibility by appearing to demonstrate a lack of familiarity with the issues. I hope Geisler will reconsider this idea as more and more facts come to light.